Fianna Fáil leader Micheal Martin has named eight people with no ministerial experience, including one Senator, three councillors and a party member unelected to public office, to his new team of party spokespeople. Well, it’s certainly ‘new’, though I’d be interested in precisely how, other than hoping to assist in the election chances of those who are candidates, those spokespeople will operate in the wake of the election. A further straw in the wind on the ‘new’ component is that he’s clearly been unable to dissuade the two candidates in Dun Laoghaire from running and thereby potentially seeing both seats go west. Ah, this ‘new’ politics. In parts, surprisingly like the old. Whatever about the popularity or otherwise of the Green Party, and given the latest polling their imminent demise from national politics appears almost inevitable… what are the IT implying by the choice of these photographs? 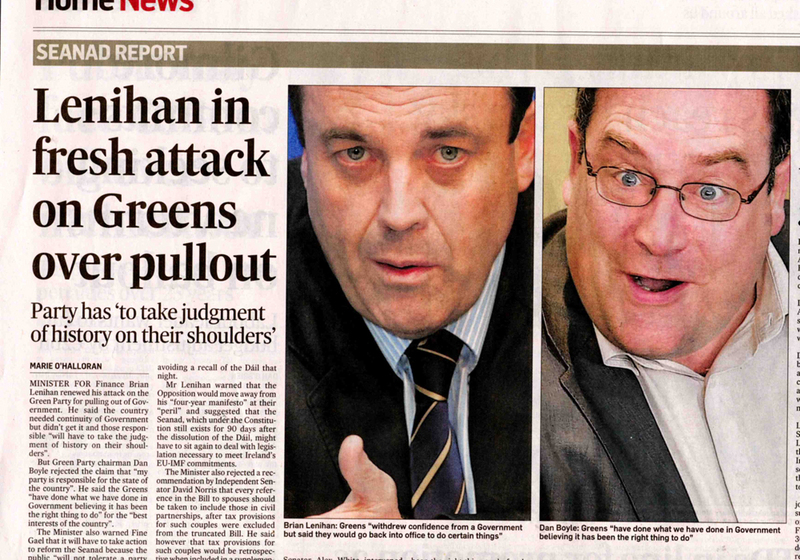 One of the more imaginative Irish Election Broadcasts…. from Dublin South East Independent candidate Dylan Haskins. Just to note that Crisisjam, the continuation of Budgetjam is on-going at Politico.ie with a range of commentary on where we’ve been, where we are and where we’re going in this economic crisis. There’s a range of contributors both familiar and new and its an interesting and useful project. More than well worth a visit. Buapestkick’s blog Ephemeral Left carries some interesting materials relating to the Laois/Offaly United Left Alliance which you’ll find here. Posted by WorldbyStorm in Irish Left Online Document Archive, Murray Defence Committee, Uncategorized. An interesting document [and many thanks to the person who forwarded it to the Archive] that serves as a companion piece in some respects to the pamphlet in the Archive on the Sallins Train Robbery and the subsequent arrest of members of the IRSP. This was issued by the Murray Defence Committee in 1976 or early 1977. It concerned the possibility that Noel and Marie Murray might be hanged for the murder of Garda Michael Reynolds after the Death Sentence was passed during their trial. Noel Murray had been a member of Sinn Féin from 1966 and had gone with Official Sinn Féin in 1970. Marie Murray had been active in the Housing Action Committee in Dublin in 1969 from which she had joined OSF the following year. Both had left OSF in 1973 but remained politically active – apparently on the anarchist left. Some sources suggest they were part of the little known anarchist splits from OSF – Dublin Anarchist Group and New Earth. As noted in The Lost Revolution, The Murray Defence Committee was not supported by Official Sinn Féin. 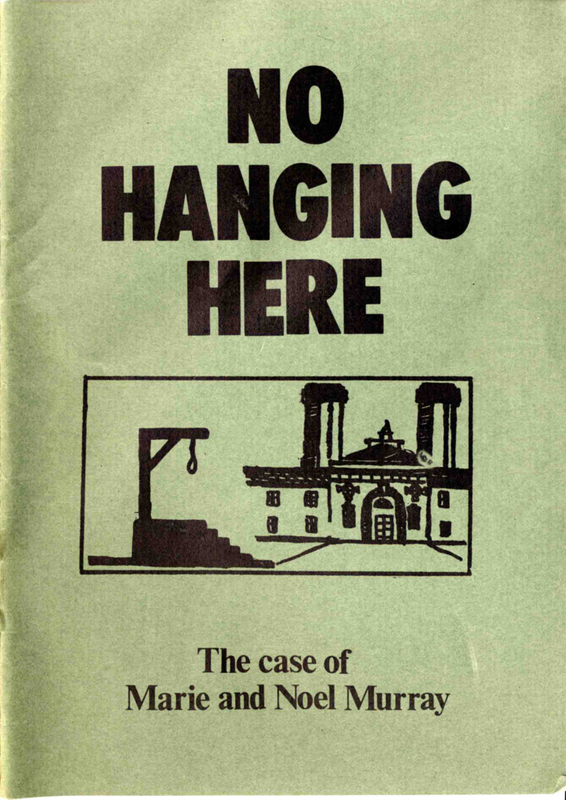 The pamphlet here is very much focused on the Death sentence which was initially handed out [and only later on appeal was set aside because they could not have known that it was a Garda that was shot, since he was off-duty] and reporting the trial and refers almost not at all to issues of guilt. It gives considerable space to the conduct of the trial and the situation leading up to it subsequent to their arrests. Interestingly it positions both of the Murrays as being ‘politically active’ and ‘continuing to fight for…an independent socialist Ireland’. On the photo on P.3 – carrying the banner on the left is Tony Gregory. Marching behind him are Mick Ryan and Seamus Ó Tuaithail. There is also some literature relating to this case here on the Irish Election Literature Blog. There’s an interview in the Mail today with Seán Haughey, son of Charles J, conducted by Jason O’Toole. In a way what is most telling is how little Haughey divulges. This seems to be a man who has decided the less said the better, and what is said is entirely anodyne. One comes away with a sense of someone who has no particular political ideology. First up there’s a fair bit of personal stuff about his father and his family. And surprisingly defensive too…or perhaps not so surprising on second thoughts. People were genuinely supportive and very favourable towards my father and his legacy despite everything. I felt throughout all those difficulties he still had great support throughout the country. ‘I know people will say, “Is that fella delusional?” But that certainly was my experience and I can’t deny that. Fair enough, but even that has the feel of displacement activity on Haughey’s part as if he’d rather not discuss contemporary politics for fear of giving too strong an opinion. People are still very opinionated about his legacy. Seán believes there is a new sense of optimism in the party following Micheál Martin’s ascent to the leadership. ‘He will bring a new energy to the party. We’ve seen that a week is a long time in politics and four weeks is a long time in politics; so, I think the election is all to play for. Campaigning hasn’t even commenced yet. I wouldn’t right us off just yet.’ Spoken like a true Haughey. A flavour of this week’s fare comes with this story, which explains why unions are superfluous to getting your rights due to the existing employment laws. Sure. It’s then followed up with a story from Louise McBride pointing to various instances where unions have failed to reverse the decisions of government or companies, as part of the following “question”. If your union means nothing more to you than boring meetings and a magazine which comes in the post every so often (which you fall asleep reading), it could be time to put that few hundred euro you pay to your union each year back into your pocket. I’m amazed to see the anti-union propaganda take such a crude and silly turn. But I shouldn’t be. Brendan O’Connor seems deeply affected by the failure of Brian Lenihan to win the Fianna Fáil leadership. Someone mentioned to me the other day that he saw Brian Lenihan on TV after the result of the Fianna Fail leadership contest and he thought, “That’s a man who is slipping off into the mists of history”. And it was kind of sad, and you found yourself thinking, as you did with Katy French, or Gerry Ryan or George Lee: Is that how that story turned out? Is that how that ended? I’m fairly sure that the overwhelming majority of people can’t wait to see the back of him. At least for now, as there may be a Mandleson-like return at some point in the future. Or perhaps that should be Haughey-like. The man who just won’t go away, Michael McDowell, is back, implicitly touting himself for a role in the formation of a new “centre-right” party. It makes you wonder if he considers himself centre-right where the actual right lies. Which brings me to the reflection that it is only after the FG-Labour coalition takes office that the conditions will be right for a new centre-right party to emerge. There clearly will then be not merely “a gap in the market” but “a market in the gap” as well. Still can’t resist invoking the magic power of the word “market”, can he? Old habits die hard. Eoghan Harris uses the fact that Chris Andrews support Michael Martin to suggest that Fianna Fáil is in danger of a swing to the left, one which will endanger, it seems, the state of Israel. As Holocaust Memorial Day fell last week, I have a question. Why, in a world of struggling peoples, are Andrews and his supporters in Flotilla Fail so focused on one people, and so aggressive toward the state of Israel — a state set up by Jews who escaped Hitler’s mass murder? Andrews and Flotilla Fianna Fail sum up Martin’s primary problem. In a country crying out for a centrist coalition, pledged to keep taxes and public spending down, Flotilla Fail presents itself as yet another populist version of the Labour Party and Sinn Fein, both in fiscal and foreign policy. Nah, I can’t follow the thinking here either. The two polls tomorrow are very close to each other, which gives them a certain credibility. No bounce for FF. Greens well under the margin of error. Labour edging slowly down. SF falling back but still at a historically high level. Others gaining rapidly – although what that last one represents is very much open to interpretation. Tomorrow’s Sunday Business Post/Red C polling results. figures in brackets are from last Red C Poll for Sunday Business Post, in December. The figures in square brackets relate to the 2007 general election. Just to add very briefly, that would seem to be it for the Green Party in terms of returned representation. The Others is interesting. Both ULA and right of centre Independent candidates adding to that figure? SF still doing well, but as he says dipping. Labour doing well too but… And the arrival of Micheál Martin giving only two per cent to FF, though that two per cent not pulled from the Independents, which surprises me greatly. Lots to reflect on over the next few days. Wire? Brilliant, no dispute. Early period, Pink Flag – stone classic, Chairs Missing – the pace slows somewhat, but in an interesting way, 154 – remarkable. Then they stopped. And then returned as an electronic band, of sorts. New Orderesque, but with a crisper edge, perhaps informed by their adherence to a much more concise form of post-punk originally. And they even charted, with Eardrum Buzz (apparently their biggest hit – well so sez wiki, so it must be true 😉 ). But to call them poppy, well, not so much. Melodic, certainly, but shot through with an amelodic aspect and with a heaviness that set them apart from the more straight ahead outfits in the same area. Later they became Wir, after one of their members left and then stopped again for a while. The 2000s saw intermittent appearances in both album and live form and a new album was released this very month. Anyhow, here are a number of tracks from that period. If you can get your hands on 1985-1990: The A List that’s pretty handy as an overview of the period. It’s a curious compilation whose running order was sequenced by polling fans. Why? Who knows. At the end there’s a piece from a live version of ‘Drill’ . We start with their finest moment of that period… the fascinating ‘In Vivo’ (this is the 7″ version apparently) followed by their second finest moment, ‘Ahead’.